Residents say they were pleased to hear the leader of the council hadn’t personally agreed to any plans to build on the town’s seafront. Catch up with the rest of the discussion in Peter’s report. A vision of Ryde high street as a social hub and an attraction for tourists, including cruise ship passengers, was presented by the Leader of the Isle of Wight council, Cllr Dave Stewart, on Monday night. 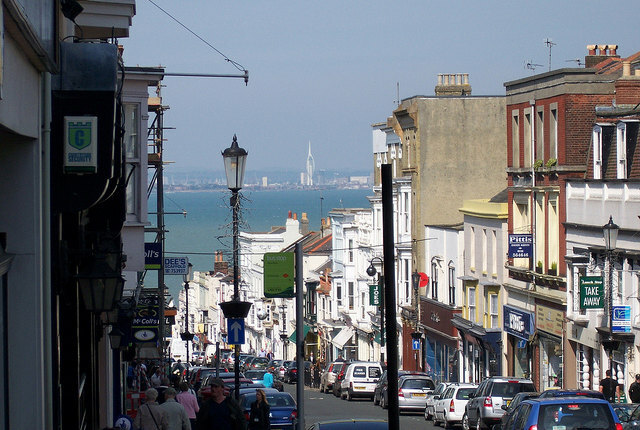 It was part of an upbeat message by the council chief, who also maintained that he hadn’t personally agreed to any plans to build on the town’s seafront, an issue which had sparked bitter controversy. Speaking at a packed meeting of the Ryde Society at the Royal Esplanade hotel, Cllr Stewart was responding to calls for better facilities in Ryde town centre, including more trees, and tables and chairs on the pavements during summer months. Talking about fears of housing over-development, Cllr Stewart pointed out that if the Island can show its “exceptional circumstances” it may not need to hit the government’s house building target, but can aim to build homes to meet local needs. Among the exceptional circumstances are the facts that half of the Island is in an Area of Outstanding Natural Beauty (AONB) and the coastline makes some places unsuitable for building. However, Cllr Stewart insisted affordable housing is needed for young people and families living in temporary accommodation. There are 2,000 people awaiting homes on the council’s housing register. £25 million has been secured for improving Ryde Pier, and the Council has made a £10 million bid for the Esplanade area. There is also a bid to win £28 million to improve the entire Island Line. Resident Jonathan Dent said he didn’t think the council leader answered all the questions, but was glad at least that Cllr Stewart personally didn’t agree to building tower blocks on the sea front. “There are 180 homes planned for green field sites near Bembridge. This is an area where roads are narrow and where there is little infrastructure like schools or public transport. 1 Comment on "Isle of Wight council leader presents ‘upbeat message’ for Ryde"